Paper has inadvertently become the signature of this fortnight’s blog. I certainly didn’t plan it. It has just happened that way with a number of interesting and arresting surprises. I have been preoccupied with paper yarn for a little while, but I’ve had real difficulty finding the right shifu half-spun yarn (about 8mm when flattened out) to execute the project I begun a month or so ago. If anyone out there knows of any such yarn then you’ll be in my debt. I have, though, finally ordered something similar, but it is 16mm. My plan had been to feature the work of the major weave exhibitor from Canada at last month’s Knitting and Stitching show. I’m going ahead with this, but my preoccupation with paper will surround this ikat weave feature. Susan Jamain’s beautiful catalogue has been well travelled this last fortnight. Back and forwards from my studio to home and on many of the journeys I’ve made by train to rehearsals. This is one catalogue I’ve fallen in love with and rejoice at having on my shelf. 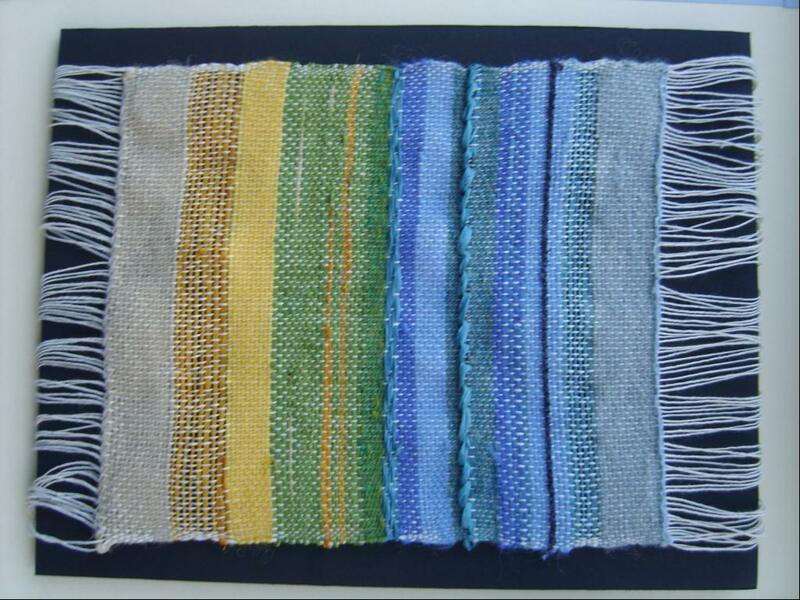 Congratulations to Susan for not indulging in all that pseudo academic interpretation speke that so many textiles artists attempt – some good and interesting, some so terrible that you could do without it. I suspect Susan has a lot to say, but her images speak so powerfully, so she lets them speak. 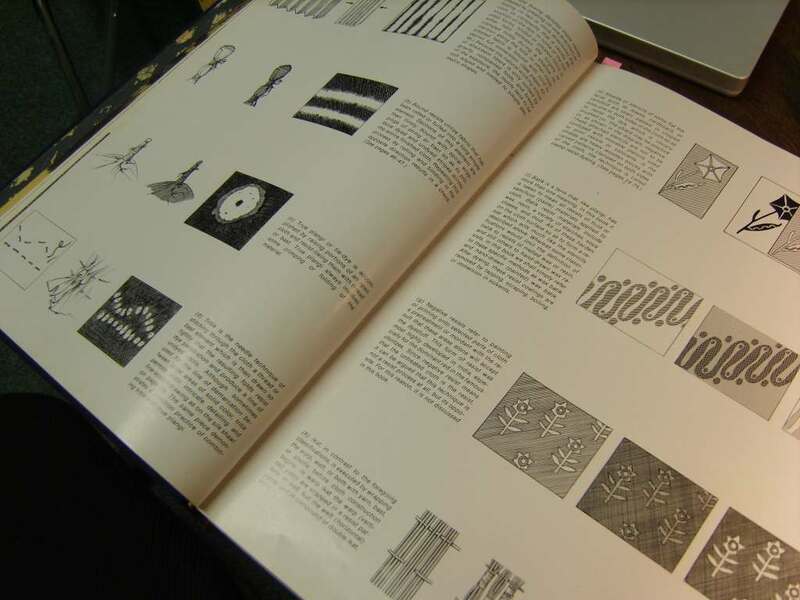 Her catalogue has a number of innovations I really admired: a whole section on process without a word of explanatory text and a 10cm x 14 cm woven piece. Her website I mentioned last week again has no text commentary, just wonderful images. So having set myself to write about Susan’s work I had to do some homework on ikat, the technique she uses to create her unique and beautiful work. It isn’t an entirely new world to me as I attempted earlier this year painting Chinese characters on to already warped ends. I now learn this is a Japanese technique called katagami – a technique using paper-stencils. I also discovered one of the great non-Japanese exponents of this approach, a contemporary of Anni Albers at Black Mountain College – Trude Guermonprez. My chief source for ikat has been a book I was kindly given a few months ago and which I had barely looked at (I’m ashamed to say there are rather a lot of books in my studio that fit that description – I could do with a month to catch up). The Dyer’s Art: ikat, batik and plangi is a very large, exquisitively illustrated volume by Jack Lenor Larsen, a name I have only recently become familiar with on account of his interest in gardens (another story for another blog). I spent a morning recently reading the section on ikat and resist dyeing generally. What I discovered was that this book was not actually by Larsen, but a Swiss anthropologist Dr Alfred Buhler whose books on ikat (1943) and ikat, batk and plangi (1972) are pretty much reproduced in Larsen’s book along with Buhler’s spectacular photos from his fieldwork across the globe. 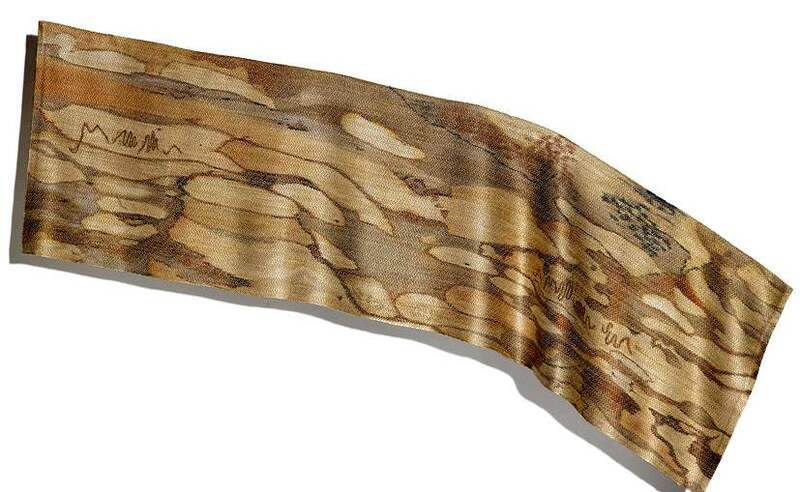 Susan Jarmain works almost exclusively in silk, this fibre that amplifies reflection and takes dye so well. She uses just three colour Telana dyes, protein premetallized dyes, formally known as Lanaset Dyes created by Ciba-Geigy. It would appear that no resist techniques are employed, but the dyes painted directly on to the warp ends before dressed and tied on the loom. 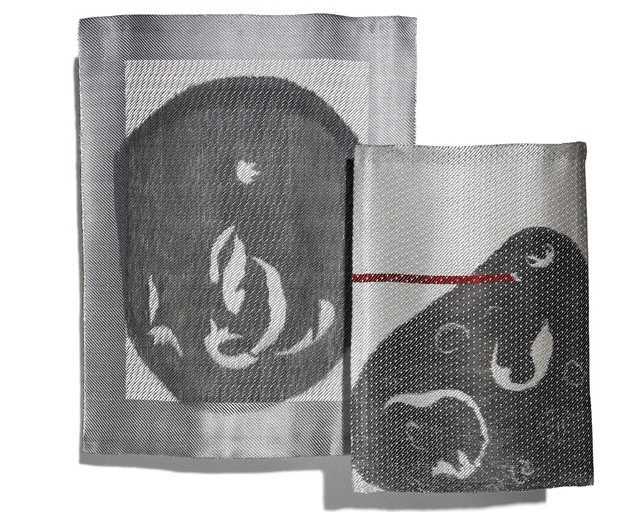 The process of sketching in pencil, pastel and watercolour precedes the dyeing process. From then on the work seems to be predominantly warp-based ikat with images and textures painted directly on to the warp ends. Quite how every end is made to line up . . . but that’s part of the magic of ikat. The subject material behind all the work exhibited at Harrogate was the natural world that surrounds the artist’s lake-side home in southern Ontario. In the exhibition this was illustrated further with drawings by her brother Nick Johnson. Sometimes this natural world is very small scale: butterflies, stones, leaves, sand, driftwood sticks. Other ikat constructions look to the larger landscape: cornfields, waterscapes, fall colours of the turning year. When my friendly Knit and Stitch guide for the day and I first entered this extensive exhibition space we both found ourselves on our knees looking intently at one of the weaves from Susan’s Leaves, Sand, Moths series. Just how were these effects achieved we asked each other? Both of us were hardly versed in ikat lore and if in answer to our curiosity Susan appeared (as we were about to place exploring – grubby? fingers on the tassled silk ends) generously guided us into her particular world, letting us feel the silk on a piece of woven silk cloth specially available for such a purpose. She showed us her mini travelling loom, dress-making pins fixed to foam board, with the weft ‘woven’ with a darning needle. It’s clear Susan makes pretty accurate mock-ups of her bigger pieces (around the 120cm x 80cm mark). I imagine there is a sophisticated multi-shaft loom in her studio to achieve some of the extraordinary effects created on these not insubstantial pieces. The exhibition showed a variety of different constructions: panels in triptych, an assemblage of eleven panels overlapping one another and in different sizes looking a little like one of those Hockney experiments photographing the Grand Canyon with a Polariod camera, cocoon-like wrappings of plainly dyed silk, oblong map-like structures displayed bent and angled,or presented wave-like across a wall, even a series of glyphs from stones arranged in a kind of alphabet (which reminds me to find space to write about Tim Ingold’s fascinating book Lines discussing the connections between weave and written scripts). So how might we read this artist’s work? For me much of it has a sculptural quality, and this is reinforced by a quotation (prefacing Jamain’s catalogue introduction) from curator Margit Rowell. This refers I think to her study of Picasso’s sculptural constructions pre 1932 which consisted of two-dimensional components or ‘flat planes’ with ‘no thickness’. Jarmain’s work is painterly, but it is woven and often inhabits 3 dimensional space in mobile-like hangings or projections from a wall. 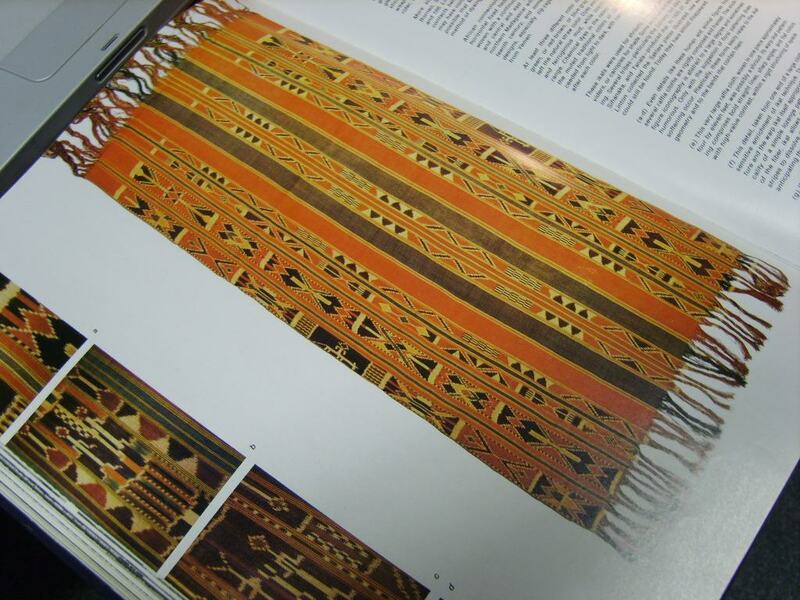 In my research on ikat I did come across the raffia warp ikats of Madagascar. 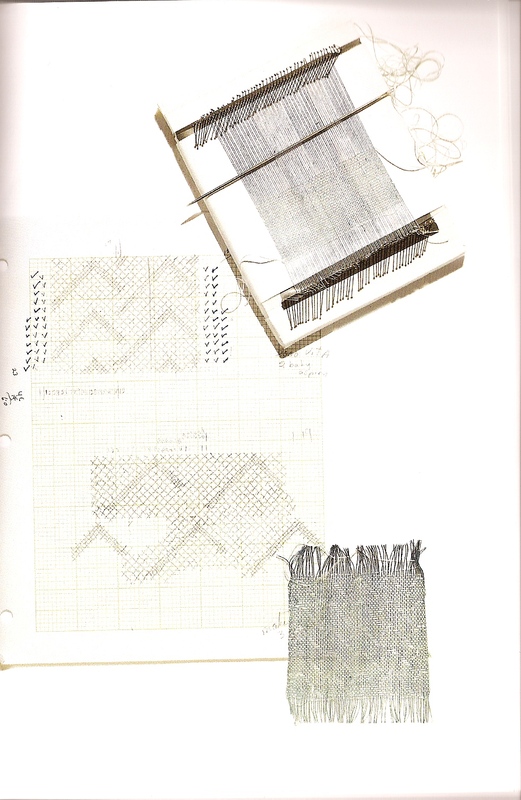 As I’m working with raffia at the moment I was intrigued to see illustrations in Larsen’s book that show ikats with the appearance of finely woven matting suggesting that the raffia fronds (usually supplied in 4-5 metre lengths) are spun into yarn. But could I find any such yarn available on the web? Nothing doing. 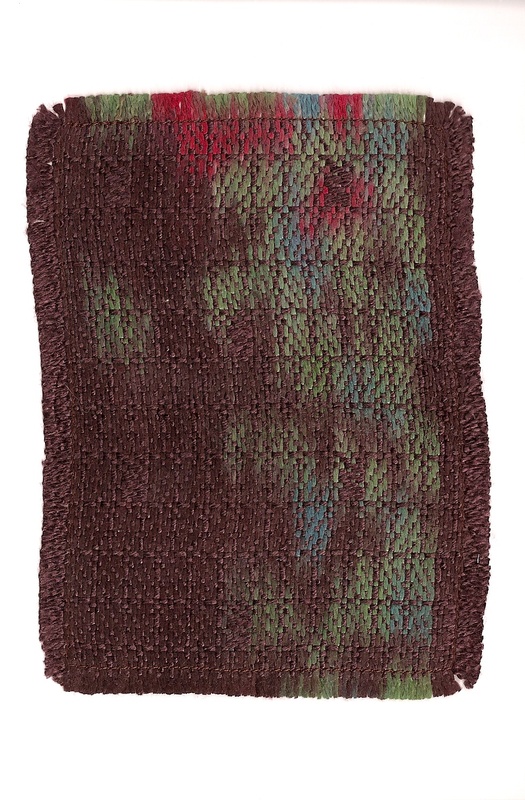 Raffia seems to take dye so well, as the matting and wall-covering specialists Philip Jeffries demonstrates (better e-mail them for some advice!). Back home in Wakefield it is getting on for Christmas and those reading these pages last year may remember my piece about Theo Moorman’s large woven tapestry made for the city’s cathedral (a tapestry I documented in photographs). 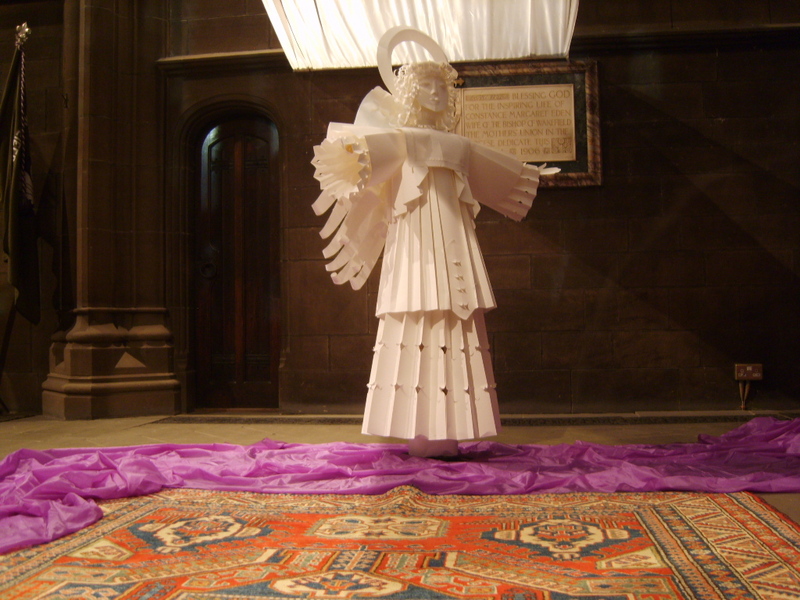 The tapestry is now up until Candlemas, but there’s an addition to the cathedral’s Advent decorations – a life-size paper sculpture of the Angel Gabriel by weaver and paper artist Shelagh Wing. I recently talked to Shelagh, a cathedral warden and former art teacher, at a cathedral get together after the Advent Carol Service (my sons sing in the choir) and she told me all about her burgeoning work in this paper world. She began making paper accompaniments for flower arrangers and has never looked back. A picture of this angel on her website prompted several immediate orders for similar figures – so she’s busy. As a tapestry weaver her last exhibition (of landscapes) at a local gallery sold out completely. The next paper encounter was last weekend. I was invited by my Farfield collaborator Alice (see the August blogs) and her daughter Hazel to join them at Yorkshire Sculpture Park for a show by the Paper Cinema. This is a three-piece group – 2 makers / paper puppeteers and a musician / composer. Brilliant is the only word to describe an experience that held an audience of children and adults spellbound for over an hour. 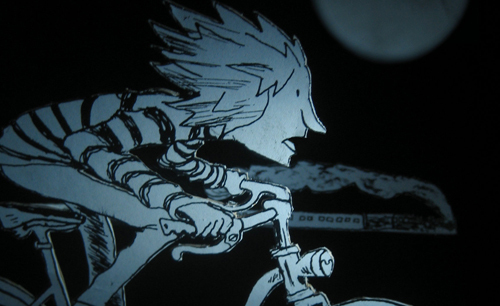 Two ‘films’ with hand-drawn (in ink) on stiff paper filmed live and projected with live music – a rendering of Conan-Doyle’s The Lost World and a fantasy adventure featuring a boy on a bicycle, lots of birds and train travelling to Scotland. Enchanting! (there’s another word to go alongside brilliant). Paper was definitely a current theme at the Sculpture Park Visitor Centre with a commission from paper artist Rob Ryan to construct huge paper cut out assemblages to decorate the gallery of large windows that run down one side of the centre’s concourse. 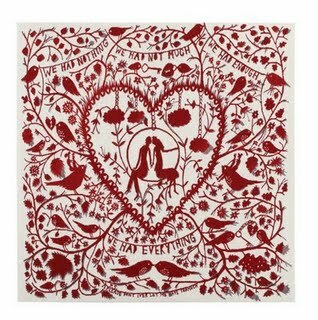 These are a little difficult to get far enough back from to get a good impression, but upstairs in a mezzanine gallery there’s an exhibition of the Rob Ryan so many people know and love (mainly through his charming and engaging books, one of which I ‘read’, enjoyed and puzzled over during my summer holiday). Many of his cut out and print paper pieces have the dearest, sweetest poems. These speak of the simple things that make us fall in love, form firm friendships, and generally treasure life. YSP have published a book showing how Ryan works and you can download excerpts from it here. 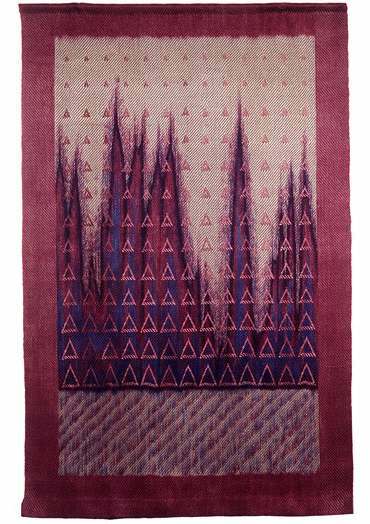 What intrigued me was a tapestry of one of his most celebrated pieces made by Nepalese weavers for the Rug Company. Those who read my recent adventure with Area Rugs in Dewsbury might like to travel ‘up market’ to this London company whose designers include Vivienne Westwood and Paul Smith. After our visit to the Sculpture Park we all went back for picnic tea at my studio. I’d just put a new warp on my loom similar to the one I used to make my latest (predominantly) raffia tapestry. This time I have spaced the warp in the reed leaving a single dent between each end. Alice and Hazel both had a play on the floor loom – their first experience. In minutes they appeared as though they were experts and the little piece they wove in turn looks better than anything I usually do . . . but I beat Hazel at Japanese chess (Go), which did a lot for my self esteem as I usually lose when playing my youngest daughter Megan-Ruth. As a coda I have to report that my song cycle Pleasing Myself is now finished and available on my web archive. This is a group of six songs to my own poems inspired by the textile pictures of Janet Bolton. I loved writing these songs and look forward to their performance next year in Cardiff. The score, which you can download as a PDF, contains reproductions of all six of Janet’s images (by kind permission).